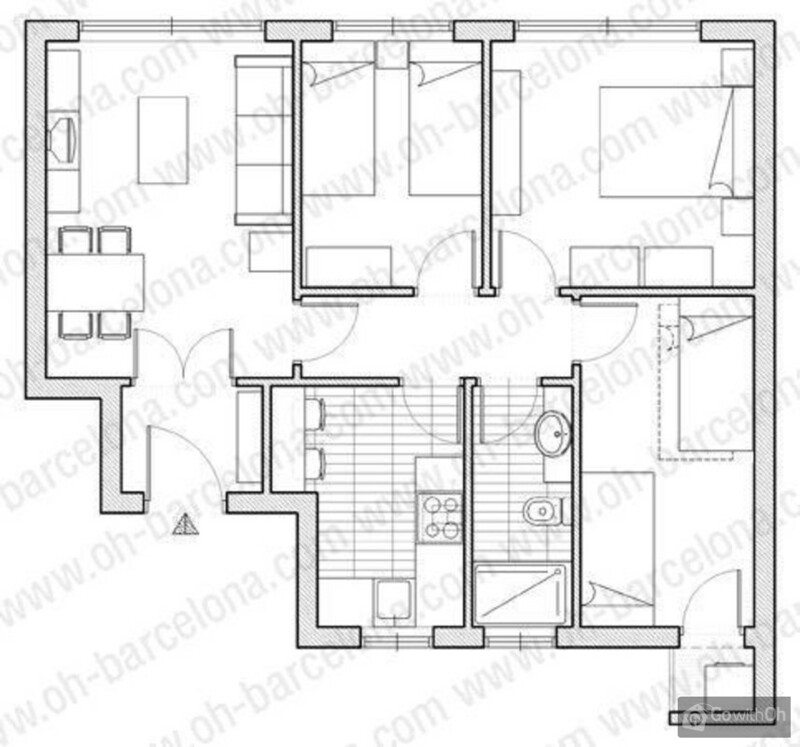 This 75m2 apartment is situated on the second floor of a building with a lift. 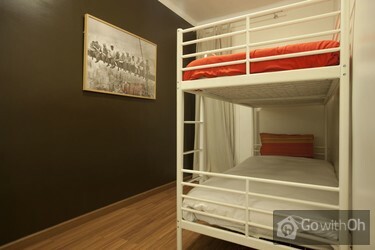 The apartment consists of three bedrooms (a master bedroom with a double bed, a second bedroom with two single beds, and a third with a set of bunk beds), a living room, a kitchen and a bathroom. 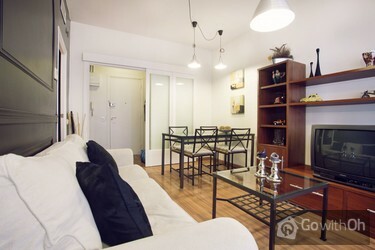 The apartment also features air conditioning and central heating so that you can adjust the temperature to your taste. 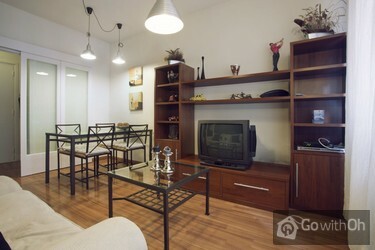 You will also have a Wi-Fi internet connection at your disposal. From 20:00h to 24.00h, extra charge of 50. From 24.00h, extra charge of 70. 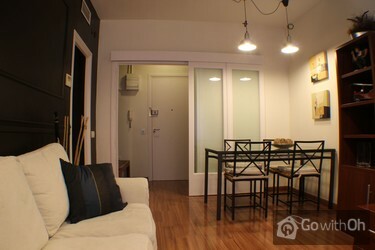 From 24.00h to 08.00h, extra charge of 70. 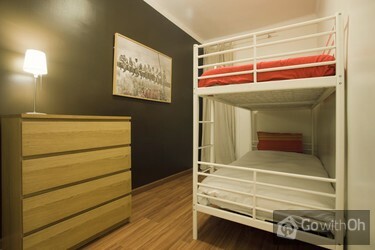 Cot available on request, extra charge of 5 per day. Highchair available on request, extra charge of 5 per day. Please confirm the availability of the equipment mentioned above prior to the arrival. 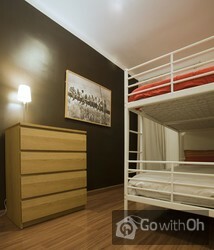 The owner only accepts bookings of families or groups of customers more than 25 years old. Muy acogedor, muy bien ubicado. Todos los servicios ofrecidos estaban bien. El Sr se porto muy bien tambien. 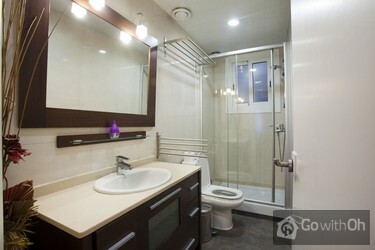 It was very clean and well looked after. All the facilities were there and in working order. 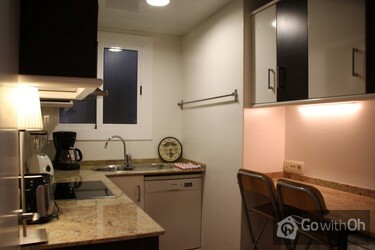 For anyone who is staying in Barcelona and does not mind using a metro, this is the place for you. lack hot water only problem. the beds were hard and there was only a bed spread and sheet though this could easily be sorted out otherwise it was a lovely local area with local shops and a good break from days spent in barcelona it's self which was fantastic. Unterkunft war sehr gut eingerrichtet , sauber und geräumig. The apartment is in perfect shape. 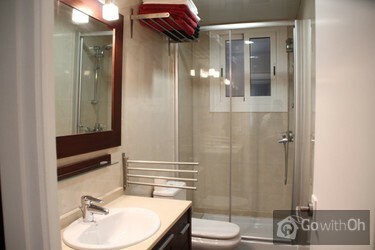 It's completely renewed, clean and comfortable. And I was able to connect to a free WiFi signal. It's located in a residential neighborhood, removed from the tourist center of town. 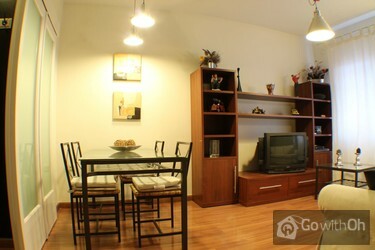 The town center is easily accessible by metro or an 7 euro taxi ride. Just watch ...out when taking showers or shaving because there's only around 12 minutes of hot water. Other than the water issue, it's a great place to stay. Wir waren dort für 5 Tage. Appartment und Kontaktperson sind super, aber die Lage ist ein-bisschen weit weg von Central(ca.15 Min bei U-bahn). Es gibt ein kleines Problem. Der Hauptschalter des Stroms schaltet aus, wenn mann in gleichzeitig den Kochplate und den Backoven benutzt. 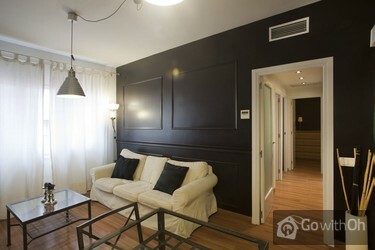 The apartment was impecable!! 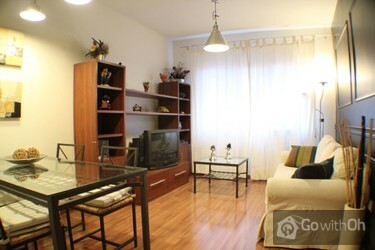 Very clean, spacious and tastefully decorated. 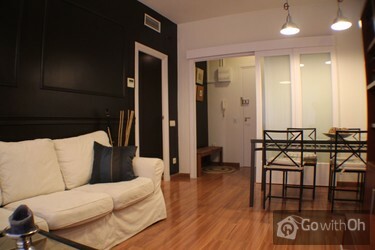 Some might consider its location in a far away neighborhood a disadvantage, but I would consider the tranquility and quite a definate advantage over the much more touristy areas such as Las Ramblas and Barri Gotico. Only problem is hot water. The reservoir is small and water becomes cold in a short time. 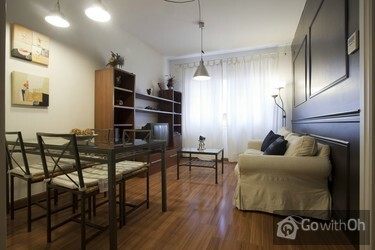 l'appartamento é molto confortevole,siamo stati molto bene,peccato che non si vedevano canali italiani!comunque abbiamo rimediato con dei dvd!lo consiglio a chi viene a barcellona per la clinica dexeus che é molto vicina,solo 10 minuti a piedi...a noi ha portato fortuna! 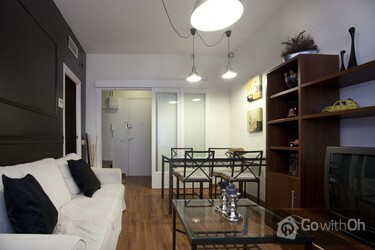 The apartment was roomy, comfortable, well-equipped and well-located regarding train and metro (and F.C.B). The contact person was also very helpful. A suggestion: greasing of inside door knobs/locks in the apartment should be carried out. 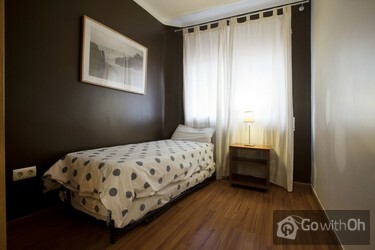 I would certainly consider renting this place again. 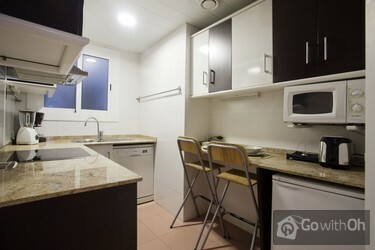 Un apartamento muy acogedor, sencillo y con todo lo necesario. Nos gusto mucho. 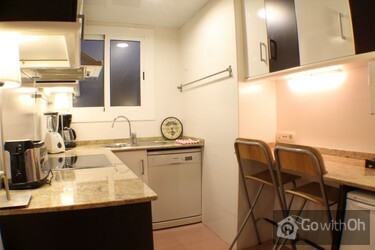 L'appartamento è piccolo ma ben arredato e tutte le forniture sono efficienti,ben collegato nonostante sia lontano dal centro.Lo consiglierei,e senza dubbio tornando a Barcelona tornerei nello stesso appartamento.Noi abbiamo avuto dei problemi con l'elettricità,ma la persona di contatto ha risolto... in tempi brevissimi il guasto che oltretutto non era nell'appartamento. Die Wohnung liegt hervorragend und ist sauber und gut aufgeteilt. Ein kleines Detail: Sie ist allerdings bezüglich Geschirr und Kochutensilien sehr sparsam ausgestattet, der Toaster funktionierte nicht und die Töpfe/Pfannen sind verbeult und zu klein für eine Belegung mit 5 Personen. Das wäre leicht zu beheben! très bon appartement, tout est super à part quelques petits désagréments tels que l'Internet qui ne marche pas, le lave-vaisselle qui fonctionne mal, l'évier bouché... mais qui ne gâchent pas l'impression générale. Die Unterkunft ist für drei bis vier Tage bestens geeignet. l'alloggio era buono, ma a piu' di 800 metri dalla prima fermata del metrò e un po' lontano del centro. Inoltre abbiamo saputo che c'era stato cambiato l'app.to quando siamo arrivati alla stazione centrale di Barcellona. Con un attimo di smarrimento in quanto la persona che ci ha comunicato il ...cambiamento non parlava italiano e quindi un pò di difficoltà a capire il nuovo indirizzo. Die Unterkunft war sehr sauber und gepflegt. Das Wohnzimmer ist etwas klein geraten. Were not aware of when we could meet the contactperson. We had to call him on arrival since oh-barcelona never confirmed the time for when to meet at the apartment. (30/12/2011) Please note that in the confirmation e-mail you'll find the contact person´s phone number and a note that warns you to call him at least 4 days before arrival. l'appartamento era carino, comodo, pulito c'era di tutto, ci siamo trovato molto bene. le persone di contatto un po' cialtrone: ritardatari sia per la consegna delle chiavi che per il ritiro. El piso está en buena condición justo al lado del Camp Nou. La única cosa es que en la télé, no había sólamente un canal (que no es grave) y que el picaporte del baño estaba roto. Tuve que esperar 40 min en la puerta del piso, cuando tal y como decia al email les llame 1 hora antes para concretar la hora de llegada. Appartamento molto carino...supermarket vicino, e la metropolitana facilmente raggiungibile...per me è stato ottimo. Solides Appartement, kleiner als auf den Fotos, aber sauber und gut. Lage 6 min von der U-bahn, 4 Stationen zur Messe, super-Bäcker zum Frühstücken gegenüber. Mit 3 Schlafzimmern, ruhiger Lage, sauberem Bad und Spitzenpreis zu empfehlen. Lappartamento era bello, pulito. La TV non funzionava. Non si poteva cambiare canale. Asciugacapelli rotto. Labbiamo detto al proprietario, però non ha fatto niente. Non abbiamo insistito visto che eravamo li per 3 notti. Lappartamento è un po`fuori mano ma ben servito dalla metro. Il proprietario conferma che ha controllato il televisore e garantisce che funziona correttamente. Allo stesso modo conferma che ha sotituito l'asciugacapelli con uno nuovo. Wir waren sehr zufrieden, es gab absolut nichts auszusetzen, war alles in Ordnung! Die Kontaktperson kam bei der Abreise nicht um 7:00 Uhr wie vereinbart, sondern erst nach Rückruf und hat dann trotzdem die 50  für das frühe Auschecken eingestreift. Das war für mich nicht in Ordnung. Das Quartier war schön und sauber. Die Lage war OK. Die Wohnung ist sehr zentral gelegen,in unmittelbarer Naehe sind viele kleine und groessere Lebensmittelhaendler vorhanden sowie auch Tappasbars. Die Metrostation Badal ist in ca. 5 Min. erreichbar. Die Wohnung ist sehr sauber gewesen und Herr R ist ein netter zuvorkommender Vermieter. Ich kann die Wohnung nur empfehlen, auch die Gegend Sants ist toll. come già sottolineato in altre recensioni, il proprietario non è stato molto puntuale, sia all'arrivo(45 minuti di ritardo all'appuntamento) che alla partenza (solo 20). Tuttavia, la bellezza della città, la delizia e la comfortabilità dell'alloggio, la comodità della posizione e la dolcezza ...stessa del proprietario, hanno del tutto oscurato queste piccole imperfezioni. Poter fumare nell'appartamento sarebbe stato il massimo, ma è solo una questione di punti di vista!! Wi-fi sembra non funzionare all'inizio, ma smanettando un po' riparte alla grande. TV: non è vero che non funziona!Basta usare la "spina" per accendere/spegnere e accendere il decoder dal bottoncino on/off che sta dietro ;). L'acqua in cucina diventa calda girare la leva a destra (verso il blu anzichè il rosso. Insomma: 10+! Die Wohnung an sich war in Ordnung, mit der Schlüsselübergabe hat alles geklappt, aber das Treppenhaus war etwas renovierungsbedürftig. Das Appartment war in Ordnung. Das Preis-Leistungsverhältnis stimmt vollauf. Die Lage ist optimal für Fußballfans. Wichtig ist, sich unbedingt nach Ankunft in Barcelona mit der Kontakperson sofort telefonisch (nicht SMS) in Verbindung zu setzen, damit das Check-in reibungslos vor sich gehen kann.... Die Abfahrtszeit (check-out) sollte schon beim Check-in bekanntgegeben werden. Cher Client A OH nous aimerions vous remercier pour vos commentaires et nous sommes heureux de savoir que vous avez profité de votre séjour à Barcelone. Malheureusement cet appartement ne dispose pas de parking, mais le propriétaire dispose de plusieurs accords avec différents parkings publics proches de lappartement, afin doffrir aux clients un tarif à un prix spécial. Le propriétaire invite, pour cette raison, à tous les clients de le contacter lorsquil vous faut un parking.